“We read to know we are not alone,” the character, C.S. Lewis, said in the movie Shadowlands. In June of 2010, Todd was diagnosed with ALS. Amyotrophic lateral sclerosis, also known as Lou Gehrig’s disease, is a progressive neuro-muscular disease that results in total paralysis and eventual death, usually in three to five years. In our grief, we were comforted by books written by others who face grief and disability. In addition to reading, we wrote of our thoughts, feelings, and experiences during the year after the diagnosis. Kristin wrote in her journal and we both blogged. Out of character from our normally reserved, private lives, we decided to turn our writings into a book with the hope that others will know that they are not alone. The book Heavy follows the gut-wrenching first year after the diagnosis. And we continue to blog on this site with the prayer that you will be comforted. Todd Neva received a BS in Business and an MBA from the University of Minnesota. He worked in marketing research, finance and manufacturing for sixteen years before becoming disabled. Kristin Neva graduated from Moody Bible Institute with a degree in youth ministry. Before becoming a stay-at-home mom, she was a full-time urban youth worker at the Milwaukee Rescue Mission. 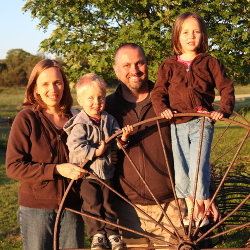 Todd and Kristin were married in 2003 and have two children, Sara and Isaac. They live in the Upper Peninsula of Michigan.